Bed and Breakfast Accommodation in Fort William, Scotland. Welcome to Kilmalyn Guest House. The Outdoor Capital of the UK, Fort William, nestles at the foot of Ben Nevis and is an ideal centre for touring the Highlands and Islands. It provides an all year round holiday destination and has something for everyone. Skye, Loch Ness, Inverness, Oban, Mull and the famous Malt Whisky Trail are only a day trip away. 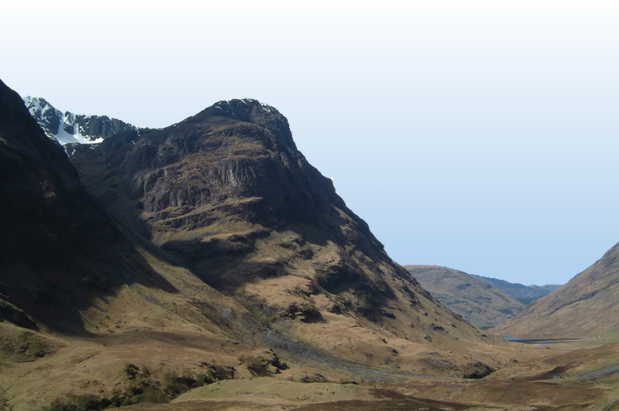 Walkers, Munro baggers and mountaineers will find more than enough to stretch them in this centre of the Highlands. The Great Glen Way and West Highland Way both start here and the area is dotted with numerous and varied bike trails including the longest downhill track in Britain. There are no less than 3 golf courses nearby. The 18 hole Fort William, the challenging 9 holes at Spean Bridge and the beautiful links at Traigh Golf Course lying beside the Road to the Isles are all within easy travelling distance. Nevis Range is the ideal place to brush up on your skiing or snowboarding technique in the winter months and the best viewpoint all year round via the gondola cable car. Paragliding is also on offer here for those with a head for heights. If indoor pursuits are more your style, then choose from the Lochaber Leisure Centre with swimming pool, gyms, squash courts, sauna and climbing walls or the Nevis Centre with ten pin bowling, children's play area, snooker and pool. For those in search of a more relaxing, less energetic break, then why not take a steam train trip on the beautiful West Highland Line to Mallaig and the ferry which takes you 'over the sea to Skye' or perhaps cruise on Loch Linnhe and see the seals and the occasional whale or porpoise. Visit the Ben Nevis Whisky Distillery and Visitor Centre or the Treasures of the Earth Exhibition. The Caledonian Canal and Neptune's Staircase are nearby. For the traveller with an interest in Scotland's rich history, find the West Highland Museum and Old Inverlochy Castle. Short drives away are the Glenfinnan Monument and Visitor Centre, the Clan Cameron Museum at Achnacarry and the scene of the Massacre of Glencoe. In the evening choose from a wide variety of restaurants and bars or take in a Scottish Show with traditional music and dancing.